It is heartbreaking to see the Pope of the Catholic Church follow an agenda set for him by neo-pagan groups such as the World Wildlife Fund. Yet this was what the world witnessed the first weekend of September. "Save the planet before it's too late,"
At this time, Pope Benedict XVI led what was called the first eco-friendly youth rally in Loreto, Italy. “Pope Dons Green Vestments for Loreto Eco-Fest”; “Pope Leads Call to Save Planet”; and “Pope Sounds New Warning on Global Warming” were just some of the headlines on the event. 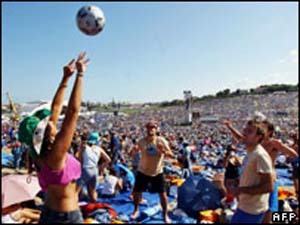 The two-day gathering, which was part of the Italian Bishops’ “Save Creation” Day, was billed as a run-up to World Youth Day 2008. An estimated 500,000 young people turned out for the event, most of them spending the night camped out in a field near the town. Pope Benedict appears to be on a bit of a Green streak. At his mid-week address on September 5, he said “the protection of water resources and attention to climate change are matters of utmost importance for the entire human family.” He then announced his support for an international conference opening Sept. 6 in Greenland. Entitled “The Arctic, Mirror of Life”, Bartholomew I, Patriarch of Constantinople, who is also called the “Green Patriarch,” led the conference. Pope Benedict also accepted an offer from a Hungarian company to plan a 15-hector (37 acre) forest that is supposed to “offset the carbon dioxide emission produced by Vatican City in 2007.” The forest, which will be planted in Hungary by the Tisza River, will be named the Vatican Climate Forest (Odd we never hear the post-Concilar Popes urge Catholics to make reparation for sin, but we can all rest easier knowing the new forest will atone for Vatican carburetors and incandescent bulbs). Now it is true we are called upon to be good stewards of God’s creation, and it doesn’t hurt to be reminded of this even from non-religious sources. I grew up on those “Don’t be a litterbug” TV ads, and perhaps the message kept my street a bit cleaner than it might have been otherwise. But the tone and urgency of the Pope’s language is not that of our Catholic patrimony, but that of the leftist eco-radicals; a kind of Greenpeace in Christian dress. One wonders who is advising the Pope on these matters. One also wonders why he seems willing to adopt the parlance of pagan groups. The entire environmental/global warming movement is marked by socialism and anti-life policies. Why would a Pope wish to be appear Green, since the Green movement is universally recognized as synonymous with the leftist agenda. 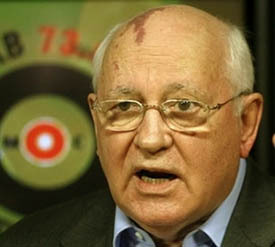 The Communist Mikhail Gorbachev, who after the alleged fall of Communism openly stated that he was still a Marxist-Leninist, founded the Gorbachev Foundation, and became a globetrotting environmentalist. Connections such as this, along with the leftist mindset of most Green leaders cause many to call environmentalists “watermelons”: green on the outside, red on the inside. Again, with sordid connections such as this, why does the Pope seem to be kowtowing to the Green agenda? Why adopt the language of the left: “climate change”; “sustainable development”; “alliance between man and Earth”? Adding to the uneasiness of it all is the fact that Environmentalists strove for years to cajole religious leaders into being ambassadors for earth-advocacy. England’s Prince Philip, Duke of Edinburgh, husband to Queen Elizabeth II and once-President of the World Wildlife Fund (WWF), openly called for religious leaders to go Green, and succeeded – with the blessing of modern Catholic leaders. 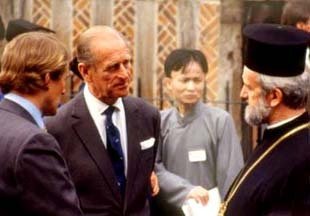 In September 1986, Prince Philip organized the first inter-religious prayer assembly at Assisi, an event that preceded Pope John Paul II’s landmark pan-religious prayer meeting by one month. At a speech delivered to a National Press Club (NPC) Luncheon in Washington, May 18, 1990, Prince Philip recounted the eco-interfaith event. He explained that 1986 was the 25th anniversary of the founding of the WWF (World Wide Fund for Nature). Therefore, “it was decided that Assisi would be the most appropriate place for the anniversary celebrations,” especially since St. Francis is now considered patron saint of ecology. “Four Buddhist monks dressed in Saffron and wearing bright yellow plumes chanted celebratory verses in deep monotone in front of the frescoes by Italian artist, Giotto. 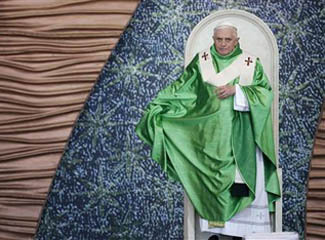 Pope Benedict’s latest Green streak appears to be a manifestation of the alliance lauded by the anti-life Prince. Babies bad for the planet! Anti-life rhetoric does not spout from the World Wildlife Fund alone, but from Environmentalists across the board. 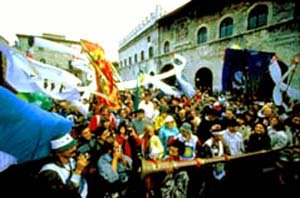 Gorbachev’s 1997 State of the World forum in San Francisco, an event billed as a building block to a new world order, gathered nearly 500 senior states-people, political leaders, spiritual leaders, scientists, intellectuals, business executives, artists and youth from 50 nations. Environmentalism’s crusade to reduce the population is relentless and continues to this day. Will the young people at the Pope’s youth rally become convinced that birth control could have a positive side? Despite the Catholic Church’s stance against contraception, couldn’t it be tolerated for the sake of Mother Earth. Especially since the Pope so dramatically called for the young people to save the planet “before it’s too late”? Pope Benedict, being a Hegelian thinker, may be able to reconcile the contradiction in his own mind, but the vast majority of young people who hear the Pope’s message probably will not. The Pope says the planet needs saving. The Environmentalist say the way to save the planet is to cut back on babies. Therefore, perhaps birth control can be “moral” in the cause of ecology; and perhaps in time the retrograde Pope may come to understand this himself. This is the message young people who have virtually no Catholic formation due to the collapse in catechesis wrought by Vatican II may very well take away from a 500,000 member “Catholic” Greenfest. Then there’s the “science” of man-made global warming. Isn’t anyone reminding the Pope there is no clear consensus on this point? Would not the Pope be aware of this due to his decades in Rome as head of the Congregation for the Doctrine of the Faith? Why assume the eco-warriors are on the side of truth when there is considerable dissent from their position in the world of science? And there is no shortage of literature on the subject. 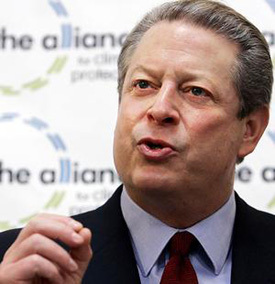 James M. Taylor, senior fellow for environmental policy at the Heartland Institute, points out that a number of the alarmist statements in Al Gore’s books and in his movie An Inconvenient Truth, do not hold up to scientific scrutiny. He accuses Al Gore of distorting science and of ignoring data that defy his theory. On alleged “global warming”. the modern “warming” is linked strongly to variations in the sun’s radiance. Although scientific papers refuting many aspects of the man-made global warming theory are published in prestigious journals such as Science, Nature and Geographical Review Letters, they receive virtually no media attention. The growing library of books and papers written by reputable scientists refuting much of the global warming hysteria includes Shattered Consensus by Patrick M Michaels. 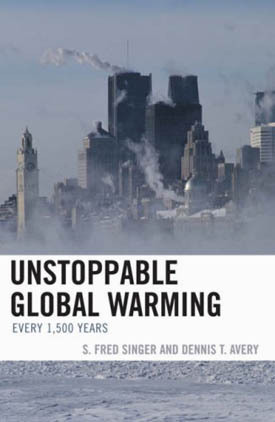 This collection contains essays from various scientists, and includes serious challenges to the claim that human endeavors and CO2 emissions are the cause of global warming. Scientists whose evidence defies man-made global warming scenarios groan at the multi-billion dollar government projects for reducing CO2. The policies, they insist, will do virtually nothing to change what they conclude to be a cycle of nature. One wonders how these scientists view the “Vatican Climate Forest” in Hungary planted to supposedly cancel out carbon emissions of Vatican City. And yes, when it comes to media fueled panic at this level, we have a right to be skeptical. Recent history gives us good reason. The more trendy the cause, the more insistently the media clangs the alarm, the more we should be wary. Remember the gas shortage? 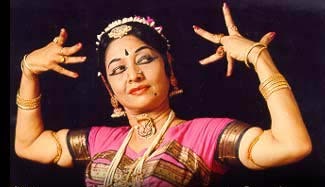 Years ago, when I played music for a living, I worked with Pat, a saxophonist whose father was an oil company executive. Pat said his father told him in the late 1960s, years before the alleged gas crunch in the early '70s, that the so-called gas shortage was coming and that it would all be a colossal fraud. The mass starvation never happened, but Ehrlich was undeterred. He went on to predict global famine in 1985, which never happened either. 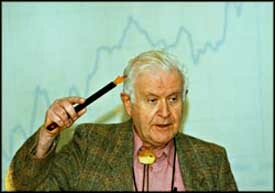 In the late 1980s, he warned that the population of the United States would shrink from 250 million before 1999 due to famine and global warming. (18) He was wrong again. How much more evidence does a sound mind need to question the science, the conclusions and the agenda of modern environmentalism? The Pope’s enthusiasm for ecology already has its trickle-down effect on the clergy. 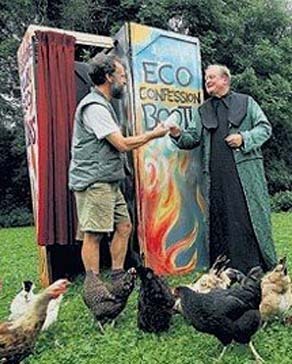 The prize instance of clerical goofiness goes to Father Anthony Sutch, a Benedictine monk who set up eco-confessions at Waveney Green Peace Festival in Suffolk, England. Father Sutch said, “I hope it is not blasphemous to do this,” but added that he took comfort in the fact that Pope Benedict XVI is keen on environmental issues. “I know the Pope has now set up his own airline and will be planting trees every time it flies,” he said. Can the lunacy become any more extreme? The shred of Catholic sense still lingering in Father Sutch is correct: the eco-confessional is both blasphemous and sacrilegious. The holy sacrament instituted by Christ for the supernatural purpose of forgiveness of sins, a sacrament established by Our Divine Lord by the shedding of every drop of His Precious Blood on Calvary so that the redemptive power of His Blood could be poured upon penitents, is profaned for the sake of pagan naturalism. In response to Father Sutch’s sacrilege, there is no report he received the slightest reprimand from Church authorities. This is what comes from attempting a synthesis between Catholicism and pagan environmentalism, from the Hegelian attempt to seek common ground between light and darkness, which is the hallmark of the post-Conciliar church. In this impossible dialectic, one does not elevate the other, but rather Catholicism is made a mockery. The degradation of Catholicism is exactly what the Pope fuels by following worldly trends rather than being the supernatural trendsetter his office demands him to be. And as far as the Pope’s eco-youth fest for cleaning up the planet, why direct this imperative to a rally of young people when it is the major corporations who do most of the polluting? Few will argue with the fact that big business bears most of the guilt on this score. Few will argue with the fact that the modern food industry actually corrupts our food, including the mandatory proliferation of genetically modified grain. So why tell the youngsters that they have to save the planet “before it’s too late”? The answer is found in the words of Gypsy Rose Lee, you gotta have a gimmick! The Pope called upon the youth at Loreto to make “courageous choices” for the environment, but how much courage does it take for youngsters to fall in line with similar eco-initiatives now in vogue at godless universities? It is now chic to be Green, and it takes little courage to be chic. Neither are the young people encouraged to dress modestly at all times. The vast majority of these misguided youngsters dress slovenly and immodestly even while receiving Communion at Papal Masses and are never corrected. Why not exhort them to courage for something that actually requires courage: resist modern fashions and adopt genuine Catholic standards of modesty. The youth at these bashes are never really challenged to give up something they love: never challenged, for example, to stay away from bad movies and to boycott any theatre that shows bad films until the theater owner promises never to show such films again; as was the practice of the Legion of Decency before the Council. If 500,000 youngsters were to take that attitude to the streets after a youth conference, this would make an impact, and incur the wrath of the city of man. 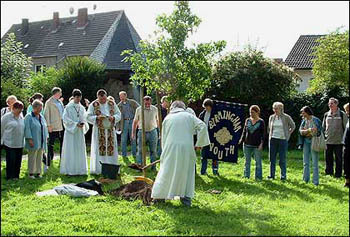 No, the youth at these gatherings are never exhorted to true Catholic action. Neither are they urged to fight as soldiers of Christ against the ever-encroaching homosexual collective; a powerful and unscrupulous movement that looms as the next great persecutor of the Church worldwide. If the Pope called young people to true Catholic causes, then maybe these youngsters would actually “make a difference” to the planet, not by running around with little hand-cranked battery chargers, but by fighting manfully in the social order to produce an environment conducive for the greatest number of souls to live their lives in sanctifying grace. Anything less than this is a fraud. It panders to the enemy, and distracts the youngster from his true Catholic purpose. 1 “Pope Urges Youth to Care for the Planet”, Associated Press, Sept. 2, 2007. 2 “Green Pope Issues New Environmental Appeal”, ANSA, Sept. 5, 2007. 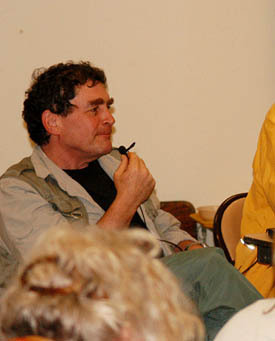 3 “Getting Naked to Save Oak Grove”, Jim Herron Zamora, San Francisco Chronicle, March 18, 2007. Another green group I came upon by chance has a name so obscene (that describes what they do in public for foresting) it can not be mentioned. 5 “Conservationists Seek Help of World Religions,” Christian Science Monitor, Oct. 23, 1986. 6 Transcript of Prince Philip’s Address to National Press Club, Federal News Service, May 18, 1990. 7 “Wildlife Fund Marks 25 Years with Ecumenical Service at Assisi,” Reuters, Sept. 29, 1986. 8 “The Contra-Genesis Project,” Suzanne Rini, The Angelus, May, 1996. 9 Cited from Trashing the Planet, Dixy Lee Ray with Lou Guzzo, (Regnery: Washington, 1990) p. 169. 11 “Pope and Prince Philip Join Forces to Save Nature,” Reuters, April 10, 1990. 13 “Global Swarming: Is it Time for Americans to Start Cutting Our Baby Emissions?” Daniel Engber, Slate.com, Sept. 10, 2007. 14 “Alarmist Global Warming Claims Melt Under Scientific Scrutiny”, James M. Taylor, Chicago Sun Times, June 20, 2007. 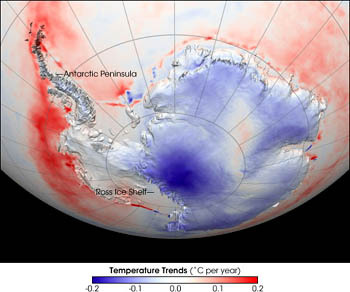 15 “Challenge to Scientific Consensus on Global Warming: Analysis Finds Hundreds of Scientists Have Published Evidence Countering Man-Made Global Warming Fears,” PR Newswire, Sept. 12, 2007. 18 See Trashing the Planet, p. 168. 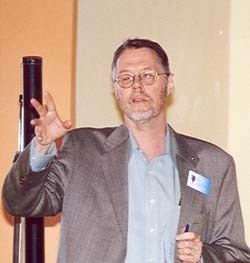 19 Wikepedia entry on Paul R. Erhlich. 20 “Eco-sinners offered ‘Green Confessions,” London Times, August 30, 2007. 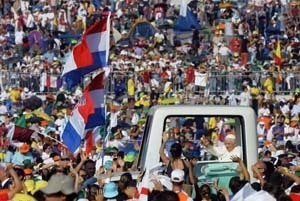 What's Wrong with World Youth Day?